The Triple Twister Slot is one of the most famous slots by Realtime Gaming, an renowned american software and games developer. Generally, the slots of RTG are not very common in Europe. There are some online casinos which offer realtime gaming games. Unfortunately, some of these casinos have a very bad reputation. That’s why we do not promote RTG casinos. The slots, however, are really good and quite popular. The Triple Twister Slot is definitely fun. 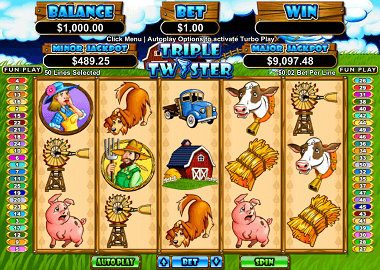 The Triple Twister Slot is a 5 reel slot with 3 symbols each. The game has 50 fixed paylines. As you can easily hear, this game is about Twisters. These are animated while you play and do not cause chaos but extra winnings. Next to the Twister symbol you will find all sorts of symbols of a farm. This includes the farmer, the farmer’s wife, a cow, a pig, a dog, a truck, a windmill and the farmhouse. The weather vane is your scatter symbol. The twister symbol appears in the base game only on the middle reel. It acts as an extended wild symbol and builds more combinations. The farmer and the farmer’s wife are the most valuable symbols and pay up to 3333x your line bet. In combination with a Twister Multiplier even up to 9999x your line bet. At £50 maximum bet you’ll get the top award of £50.000! Other valuable symbols are the farmhouse, the cow and the pig (333x with a 5 combo). The free spins on Triple Twister slot are triggered with 3 scatter symbols. You will receive 9 Free Spins and you can extend the feature! All your winnings with Free Spins will be boosted by a multiplier at the end of the feature. So even if you do not win so much, it can still be good for you. But the best thing happens when the Twister symbol lands on your reel three. Then the Twister becomes tripled and turns three complete reels into wild symbols – some big winnings become reality! As mentioned above, we do not offer Realtime Gaming casinos. You can play a nice selection of RTG Slots here for free. If you click on the banner above, you can start with the Triple Twister. In return we have some recommendable Playtech casinos. These games are very similar to the RTG slots. Just like RTG, you can download casino software or play directly in the browser. In all online casinos you can also redeem a bonus or play free spins!